Have I told you how much I love Catalyst Ranch? It's a wildly creative space, so outrageous you might think I designed it! If you're looking for a location for your next meeting or seminar or retreat or party...and you want a place that will stimulate your creative juices, check out the Ranch. A couple weeks ago I did my presentation Speak Loudly and Carry a Big Shtick!TM there and it was awesome. That presentation is on how to become a better speaker, and Lauren Smith wrote about it on Catalyst Ranch's blog. Check it out...I couldn't have said it better myself! 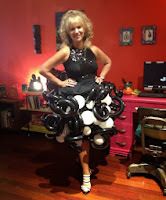 She’s motivational, charming, sensational, inspirational, humorous and, she gave her latest presentation at Catalyst Ranch wearing a skirt made out of balloons. Really, the whole thing! I’ve seen a lot of wacky stuff in my time here but a balloon dress was a first. Mikki Williams is a lady with eclectic tastes and she has channeled her flamboyant style and infectious energy into award winning presentations. This summer, Mikki was inducted into the National Speakers Association Hall of Fame, an achievement attained by fewer than 1% of all professional speakers. Catalyst Ranch is very lucky to have Mikki Williams present not one, but three of her signature presentations. Last week I attended “Speak Loudly and Carry a Big Shtick!” and learned many new tricks that I will incorporate into my next presentation.